It is possible to over romanticise the past, especially when it comes to Christmas. Rosy pictures of past Christmases, often influenced by television ads rather then reality, can obscure a dispassionate retelling of Yuletide festivities of yore. 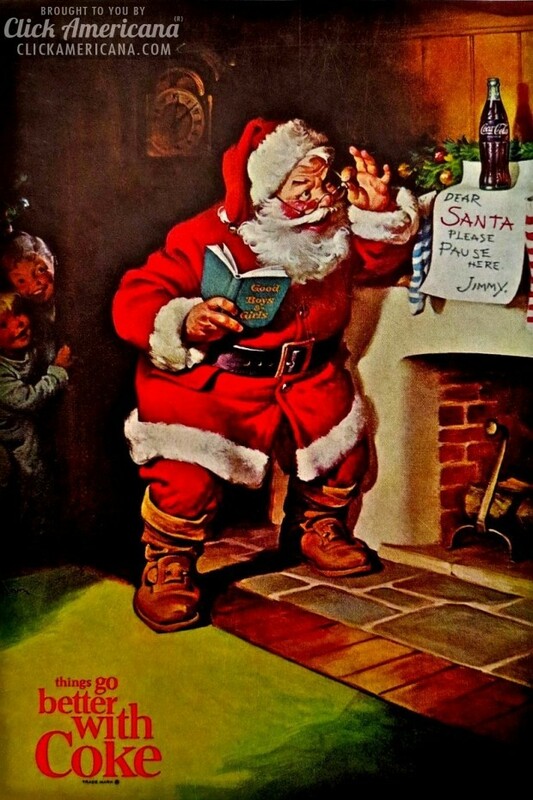 Much of the iconography of Santa Claus is based on images created by artist Haddon Sundblom between 1931 and 1964 for the Coca Cola seasonal advertising. However, it has to be admitted that commercialisation of Christmas seems to be very much here to stay. 62% agreed that Christmas is a time when we should be generous to people less fortunate than ourselves. 41% agreed that Christmas is a about celebrating that God loves humanity. 24% disagreed with this. 40% said Christmas is a good excuse for taking time off and doesn't really have any meaning today but 34 % disagreed with this. The results of such surveys point to an unhappiness with the commercialisation of Christmas but in fact marketing departments can use these views to target advertising strategies. 24 per cent do not plan their Christmas spending. Whatever we think of the true meaning of Christmas, the Christmas holiday tradition of overspending is a dangerous monster waiting to devour us. Ponder these things my friends and beware. And cut up that credit card.